In this section I am documenting the final stages of building construction. The exterior shell of the building was constructed when my home was built. 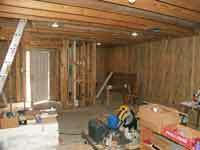 It was completely finished on the exterior, but the interior was nothing but bare studs. In the early years, no attempt was made to finish the building as it was in use primarily as storage for myself, family members and even a friend. Interior work was performed in kind of a hit-or-miss fashion mainly as time and finances permitted. 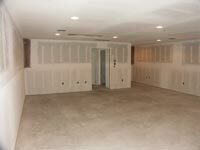 The plumbing rough-in was completed, the central air and heat was installed and the electrical systems were all roughed-in. But it wasn't until after Labor Day of 2009 that work was begun in earnest to get the interior completed so that layout construction could commence. And that is where this page starts. Click here to jump down to the latest photos. 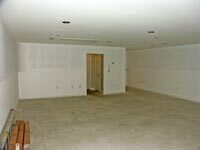 Update - September 15, 2009: Building construction has resumed! After literally years of delays, work is being done to prepare the building interior for sheet rocking. 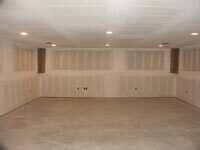 The electrical, plumbing, air conditioning and heating work have been completed. 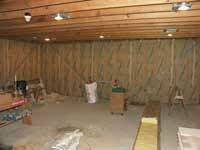 The walls are almost finished being insulated. 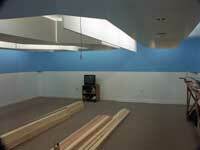 A few minor details remain, and then the gypsum board can be hung. 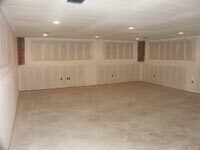 After that, the final trim-out work, cabinets, painting and carpeting will occur, and then layout construction can finally commence. I'll document the work via this page. View of the new train room from the room entrance. 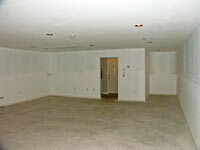 In this view, we've moved left of the room entrance. The sheet rock pile is waiting! Moving forward to the opposite end of the room and looking back toward the entry. And finally, we've moved left to the other corner, still facing toward the entry. 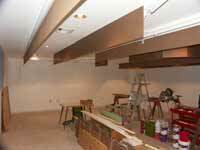 Update - November 22, 2009: The gypsum board (sheet rock) has been hung! Today the floating and taping began. This should be complete by the weekend after Thanksgiving. Good progress is being made now, and layout construction should not be that far into the future. 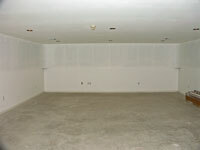 I'll try to post a couple photos of the train room as soon as the sheet rock finishing is complete. 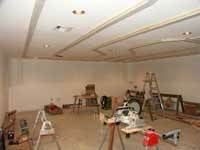 Update - December 10, 2009: The floating and taping was completed the weekend after Thanksgiving, and the primer/sealer has been applied to the gypsum board. The finishing coats of paint should be starting by the weekend. The photos below were taken just before the primer was applied. View of the new train room from the room entrance. In this view, we've moved left of the room entrance. Moving forward to the opposite end of the room and looking back toward the entry. And finally, we've moved left to the other corner, still facing toward the entry. 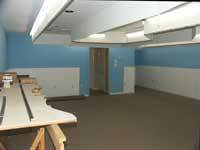 Update - February 28, 2010: Slow, but steady progress is being made for the train room (and the building overall). 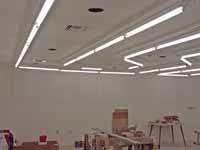 The electrical receptacles, switches and general lighting are complete, and the HVAC grilles and diffusers are in. 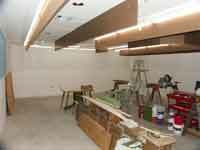 The cabinets are installed in the shop area, and painting is well underway. Doors, trim and other millwork are complete. 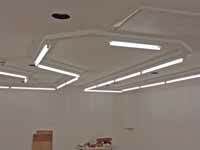 I'll be using strip fluorescent lighting behind valences for layout illumination. The strips were specially ordered and have just arrived. 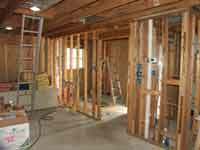 When all this work is completed, the only remaining tasks will be to install plumbing fixtures, insulate the attic, and install the flooring. My unofficial schedule calls for benchwork to commence in the late spring, and so far it looks like I'll be able to make that. Here's the same view as in the first photo above, after priming and painting. Here's the same view as in the second photo above, after priming and painting. Here's the same view as in the third photo above, after priming and painting. And finally, here's the same view as in the fourth photo above, after priming and painting. 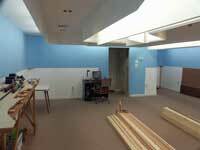 Update - September 5, 2010: The layout lighting has been completed. I decided to use 2x4 lumber attached to the ceiling to serve as an attachment point for the valences and to mount the fluorescent light fixtures. The first step was to screw the 2x4s to the ceiling with their outside edges directly above the outer edge of the (future) benchwork. The accomplish this, I drew out the edge of the benchwork on the floor with a large felt tip pen. Dimensions were taken directly from the CAD drawing I have used to design the layout. 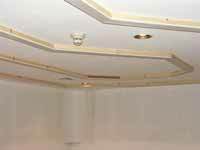 Then, with help from my able bodied assistant Wayne Robichaux, I transferred key points to the ceiling using a simple plumb bob. 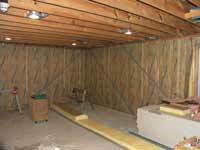 We measured and cut the lumber, located the joists above with a joist/stud finder, then screwed it to those joists. In a couple places where the 2x4 had to run parallel to the joists and didn't coincide with a joist location, I went in the attic and added some bridging between the joists so as to have a place to attach the 2x4s. 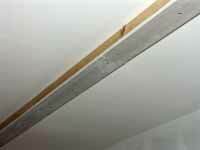 To meet the building code, 1/2" gypsum board was cut the width of the 2x4s and screwed to the bottoms. 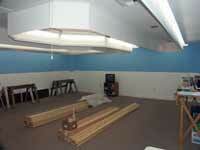 The whole assembly was primed and painted with the ceiling white paint, and then the light fixtures were installed. The following week, we ran the electrical power to the lights, and then over the next couple days, I got all the connections made and the fixtures closed up. When I finally flipped the switch on, I was almost blinded! 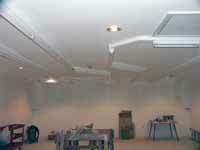 This many fixtures produces PLENTY of light. 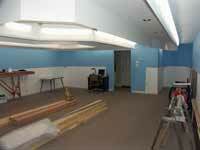 I fully expect that the light level will drop significantly later as the room, and then the layout, is completed. The carpeting will be on the darker side, the backdrops will reduce reflectivity from the walls, the layout itself will tend to absorb light, and the valences will contain the light somewhat and prevent areas from being lit by several sources all at once. I'll pass on comments about the lighting level from time to time as these things develop. Here's a shot of the 2x4 stripping that will be used to attach the valences and light strips. Here's a view from the other end of the room. The can lights are over the (future) aisles. The return loop of the stripping is over the orb at the end of a peninsula of the layout. And finally, here's a close up view of the 2x4 / gypsum board assembly prior to priming and painting. And here is what the lighting looks like. This view is from roughly the same vantage point as the shot above. And the view from the other end of the room. There is no doubt that the can lights won't be needed during layout operations! Here is one of the return loops over an orb at the end of a peninsula of the layout. 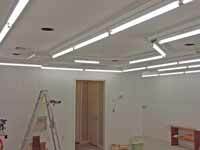 This last photo shows the strip fluorescents off and the can lights on. 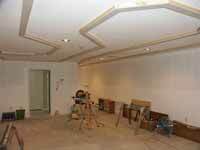 Valences will be installed next. Update - February 10, 2011: It's been quite a while since my last report. Construction has proceeded at a slow, but steady pace. Much has been accomplished over the last five months, though most of the work is unseen or recorded in this log. 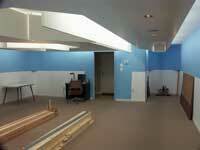 For example, the workshop room is finished now, and the bathroom is nearly done. The attic insulation has been installed, most of the plumbing is complete, and the heating and cooling system is fully operational. The layout lighting valence is the current big project. 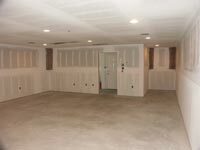 This is under construction and is the last thing to be built inside the train room itself prior to starting benchwork. I have to confess that this seemingly little item has in fact become one of the biggest ordeals that I've experienced in this entire construction project. Essentially, the valence panels are up and I'm in the process of joining/sealing the edges of the panels, both to prevent light from coming through the joints, and to provide a more finished appearance. The last step will be applying a small U-shaped channel molding to the bottom edge. I may do a short article in the future outlining the construction details and sequence (along with how I'd do it next time). 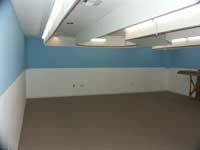 Along the way you'll notice that the carpeting has been installed and the backdrop has a coat of Sky Blue paint. 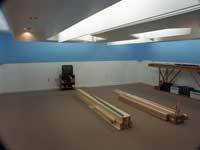 When the valence is completed and the clouds are painted on the backdrop, benchwork will finally commence. The valence work has started. These panels will border the entire layout when finished. Here's a view taken again from the same place with the fluorescent lights on. I'm standing where benchwork will be; the "dark" area is the aisle. And the view from the other end of the room. Each panel was trimmed to match the end of the adjacent panel. And here is one last view looking toward the building entrance. 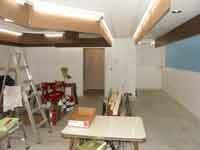 I'll take the panels down after completion to facilitate painting them. 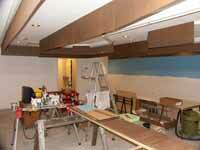 Back to our starting corner for the first shot of the painted panels reinstalled. 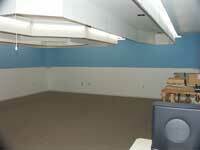 Note also that the carpet has been installed. And now looking back toward the building entrance. As you can see, the backdrop now has a coat of Sky Blue paint. The next step is to trim out the panels. There will also be some short view block panels running down the center of each peninsula. And one final view of the new valence. The planned view blocks will be at the ceiling to shield the view of lamps from the opposite side of the peninsula. 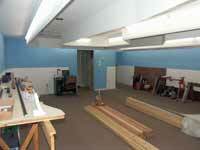 Update - April 15, 2012: It has been two and a half years since I started the build-out of the train room and shop. In February of 2011 I predicted that benchwork would be starting in the spring (of 2011). I didn't dream I would still be working on the building over a year later! I have to admit that I grossly underestimated how long finishing things up would take, especially since work only occurs on weekends. The building itself, including the shop and restroom, has long been complete. The big hang-up has been the lighting valence and the addition of view blocks in the peninsula areas. The original construction of the valence panels seemed simple enough as shown in the photos above. But even getting to that point turned out to be a much more difficult and time consuming project than I had anticipated. But to make things worse, the concept didn't work. Within a few weeks the hardboard panels began to warp considerably. I wondered if I added stiffeners to the panels if they would straighten out. I had an eight foot piece of steel angle handy so we temporarily clamped it to the bottom of a panel and let it stay for a month. The panel was easily pulled back into line with the steel and stayed that way. So the next step was to add some 1"x2" wood stripping to the bottom of the entire run of valence. The stripping was glued on using carpenters glue and it worked out fine. There is some gentle waving here and there (the result of the wood stripping itself not being perfectly straight), but it is much better than it was, and the slight waviness is generally not noticeable unless you're at an end and sighting along the edge. Next I had to tackle the problem of joining the corners. The right angle corners weren't a problem, but most of the corners are at angles, some at 45 degrees, others at odd angles. I ended up cutting wooden blocking into five sided shapes, with the specific angles required on two adjoining faces. Inside corners required a different solution as I couldn't cut the blocking on the table saw to the required angles. I solved that by cutting two blocks, then gluing them together. These blocks were then glued to the back of the panels and worked out surprisingly well. They don't look very attractive from the backside, but no matter as that is not the normal viewing angle. The entire valence structure became much more rigid after the addition of the strips and corner joints. The last step was to dress up the exterior (aisle side) of the joints. Again, the right angle joints were simple as I found some inexpensive plastic molding made for that purpose at the Home Depot. But the other angles were a problem. I pondered this for many weeks and then one day while cruising the aisles at H-D, I noticed some very heavy drywall tape with a preformed crease down the center. This tape is quite stiff and has a very slight texture. I thought maybe it would work to simply cut it to length and glue it over the joint. I did just that, using 3M Number 77 spray adhesive. Generally this worked out pretty well; the only problem I incurred was that the adhesive didn't stick as well as I would have liked to the already painted surface of the hardwood panels. I ended up double coating most of the tape sections and that seems to have done the trick. I then primed and painted all the strips, blocking, moldings and trim strips, and gave the entire valence another coat of paint. As it turned out, I had to apply a second finish coat to the outside so that the "sheen" of the paint was consistent for both the panels and the trim. The overall result is not perfect by a long shot, but it is acceptable. These next photos are of the completed valence, but before the installation of the view blocks. Beginning at my usual starting point, here is a look at the completed valence. And here's the view from the opposite end of the room. 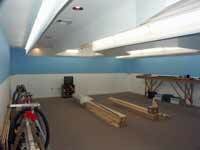 Moving to the left, I'm standing where bench work will eventually be to show a broader area. And here I've moved to the opposite end to show the view from the fourth corner of the room. Back to the same corner as the second photo above, but moving over into the aisle to give a more typical view of the lighting. And now I've moved even further over to the far corner. And one final look at the new valence. This view is also of the center aisle, viewed from the doorway. As expected, when standing in the aisles viewing the (future) peninsula areas, the fluorescent lamps on the opposite side were glaring right in your face. I solved that by constructing some view block panels that run down the center of each peninsula. I also put a couple shorter panels where the peninsula fans out at the end (the blob). These panels were made by gluing and stapling hardwood panels to either side of a wooden 1"x2" frame. The reason for this construction was twofold . . . I wanted a smooth finish on both sides, and I knew I would need some reinforcing to keep the panels from warping and waving all over the place (lesson learned). To hang the panels, I screwed hooks into the ceiling joists, then screw eyes into the top edge of each panel. They simply hang from the ceiling. While they don't eliminate every possible glimpse of light from the opposite side, they do shield about 90 percent of it and I'm pleased overall with the result. The photos below show the final result of all this effort. The next step will be painting some clouds on the blue sky backdrop. Those piles of lumber in the pictures are some of the benchwork components. Maybe this spring will finally see the beginnings of a model railroad layout! Again, back to our usual starting point, here is a look at the completed valence with the view blocks installed. And here's the view from the opposite end of the room. Note the view block hanging within the center of the peninsula. Moving left to the far corner of the room, the view block can be seen within the peninsula to the right. And again I've moved to the opposite end to give the view from the fourth corner of the room. 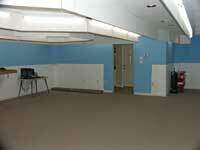 This is the view of the center aisle from the doorway into the room. Moving to the corner at the right. And now a view from the opposite end of the room. This view is again of the center aisle, but facing the doorway. Now moving a bit to the right. This aisle is the longest on the layout. This is the same view as the picture above, but the down lights over the aisles are turned off. Again, a similar view as that above with the down lights turned off. 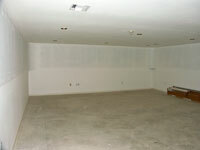 And one final view of the room with the down lights turned off.